Pole and occasionally Lyra. 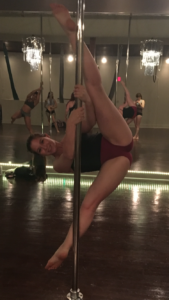 I started Pole May 2017 and Lyra July 2017. I have met so many amazing people! These classes changed my life because they’re therapeutic and make exercise fun! Outside to inside leg hang. I would say Puerto Rico. I haven’t done a lot traveling…yet! Tellus 360, Federal Taphouse, Central Market, and Hidden Treasures Antique store.